Gunne Estate Agents has rebranded and changed its name to Quillsen. Alongside the new name comes a fresh modern new look and a renewed focus on expansion. Gunne has been in business for almost 60 years and maintaining its reputation as one of Ireland’s leading estate agents and valuers, Quillsen will continue to provide the same impeccable service to its clients. Quillsen is the name that will drive the company through the next 60 years and beyond. The forward thinking venture to modernise the image of the company was embarked on earlier this year. 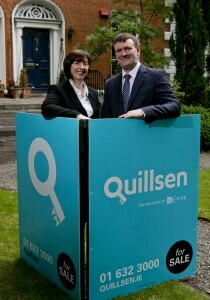 Quillsen will rebrand its seven high profile branches at Ballsbridge (Head office), Dun Laoghaire, Fairview, Glasnevin, Terenure, Ranelagh and Navan with immediate effect. The distinctive new Quillsen ‘For Sale’ boards will appear on the streets over the coming days. A weighted media campaign will run in conjunction with the launch. Quillsen specialises in the sale of residential property. With a new suite of property brochures, for sale boards, an updated website and strong social media channels, the focus will remain on garnering the best possible results for clients, who are guaranteed the highest level of commitment and customer care. Mel O’Rourke, Creative Director of design agency, Creative Inc, who worked on the new brand stated: “Gunne has been part of the property landscape for such a long time, we wanted the new brand identity to feel established yet have a new freshness that would set it apart from its competitors. The name Quillsen, an amalgamation of the Directors names, we felt had the required strength to carry the brand to a new level.